The ReStore always has a wide assortment of new and used light fixtures. 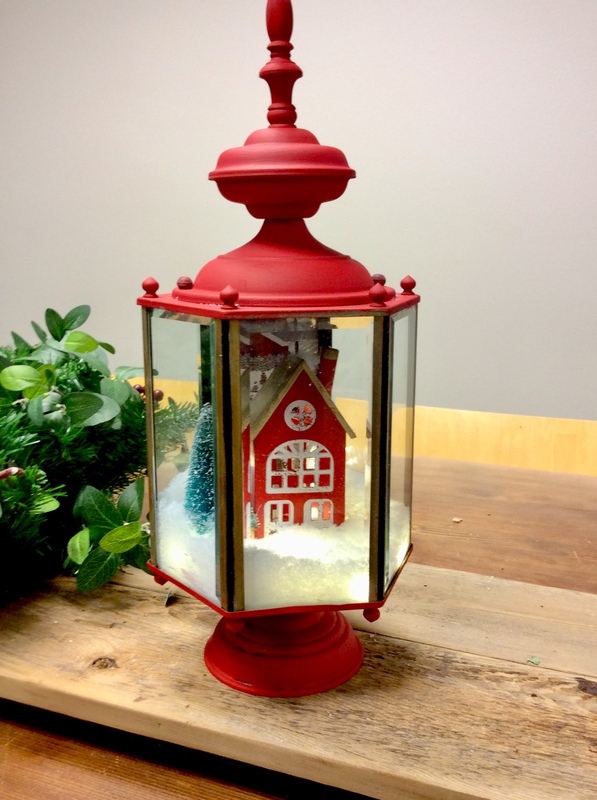 When we found this lantern idea on Pinterest, we thought it would be fun to try it ourselves using a donated exterior wall sconce priced at under $12 at one of our stores . It was so much fun to do, we wanted to share! Try it out. 1. Select a lantern or other style light fixture. 5. Place fairy lights at bottom of fixture. Secure with scotch tape. 6. Place glue dots or other gummy adhesive to bottom of figures/ornaments, and set figures into bottom. 7. Pour in articial snow to cover fairy lights. NOTE: Use fairly lights that have a timer so that you don't have to reach into the light to switch it on and off. Here are photos of the steps. Lamps are really fun and simple to take apart and screw back together in different configurations. We ended up swapping out the smaller rounded pieces for the larger one that is shown directly under the fixture. This helped to prevent tipping. To keep the fairy light wires somewhat flat we used a piece of tape to secure it to the bottom. Remember to use lights with a timer so you don't have to keep reaching in to turn it on and off every day. Our light sconce had a metal panel...which can look fine, but we opted to print up a random photo and place it in the panel, creating a bit of background. The holiday lantern looks great solo, or sitting nestled in a wreath!